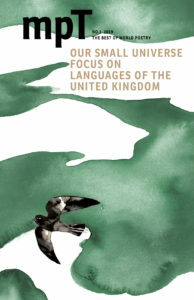 To mark the publication of Our Small Universe: Focus on Languages of the UK, we’ve populated a map of the UK with selected poems from the issue. We’ve also worked with poets and translators from around the UK to create a playlist of readings in different dialects and languages of the UK on our Soundcloud page, which are also marked on the map below. The majority of these poems are selected from the print issue, with further selections from our recent AE Housman translation workshop. There are many more poems to read in print, or online via Exact Editions – and you can see the full contents on the magazine issue page. Please note the locations of some map markers may be approximate. In addition, many featured languages or dialects are not restricted to any one region, but found in many places in the UK. Please contact the online editor if you wish to suggest a correction to any of the beneath geo-tagging.